Samdani Art Foundation (SAF), in collaboration with Bangladesh Shilpakala Academy (BSA) and Bangladesh National Museum (BNM), organized the first Dhaka Art Summit (DAS) from the 12th till the 15th April at National Theatre Hall, BSA. 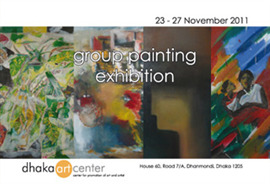 Bangladeshi senior artists and many young artists took part in the summit with their paintings, prints, installations, photo installations, video installations and sculptures. Documentary photographer Khaled Hasan clinched the ‘Samdani Artist Development Award’ and promising artist Musrat Reazi won ‘Samdani Young Art Talent Award’ at the closing ceremony of the four-day Dhaka Art Summit. Khaled Hasan received the BDT1 million (USD12,000) prize for his work Terror Beat of Acid, a series of candid depictions of victims of acid attacks in the region. A graduate from the South Asian Media Academy and Photojournalism (Pathshala) in 2009, Khaled Hasan won various prestigious international awards. He is now studying at the Ateneo de Manila University in Philippines. Graduated from the Drawing and Painting Department of the Government Art College of Chittagong in 2008, Musrat Reazi’s award wining acrylic work titled Moorang is part of her recent series work of the same title on the struggling life of ethnic Morang community in Chittagong Hill Tracts. Reazi’s slightly blurry artwork depicts figures of Morang people and various animals, both struggling for existence. At present, she is an assistant teacher at Khagrachari Government High School, Chittagong and also an MFA student at the Drawing and Painting Department of the University of Development Alternative (UODA). Her prize money is BDT500,000 (USD6,000). A six-member international jury panel comprising of curator of Tate Modern, Kyla McDonald, Art Asia Pacific editor and publisher, Elaine W Ng, Indian artists, Ravinder Reddy and Bose Krishnamachari, art historian and critic, Deepak Ananth, and eminent Bangladeshi artist Shahabuddin Ahmed, selected the two winners from among 29 selected artists. Earlier, the summit steering committee, lead by artist Muniruzzaman, selected these 29 artworks from among the 449 submitted artworks, by 249 artists of Bangladesh. Image: Khaled Hasan, 'Terror Beat of Acid', 2011, photography. Image courtesy of the Samdani Art Foundation.